PIANO TRIO - THE DAROCH TRIO - daroch-trios Jimdo-Page! 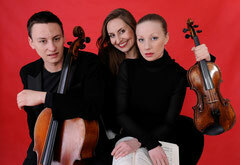 The family piano trio DAROCH TRIO consist of three siblings: Maria Daroch piano Anna Daroch violin Tomasz Daroch cello was founded at the beginning of 2003.They have made their debut in Lodz in Poland. In 2004 DAROCH TRIO was the finalists of the „Erst-Klassik Kammermusik Wettbewerb“ in Berlin. There soon followed a series of concerts at home and abroad in which the ensemble was almost ecstatically received by enthusiastic audience. They have recorded for Polish and German Radio - NDR Kultur, SWR. Daroch Trio is also a holder of the Chamber Music Diploma with distinction from Staatliche Hochchschule für Musik und Darstellende Kunst in Mannheim in Germany under Prof. Michael Flaksmana and Prof. Michael Haubera.They graduated in 2007. Daroch Trio has participated in a number of chamber music festivals and courses.